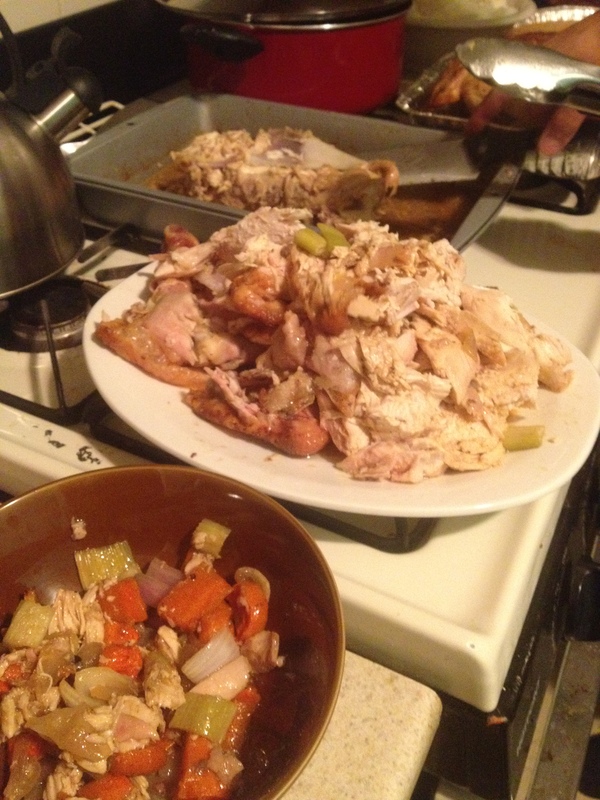 »Food»Chicken Challenge: Can You Make a Whole Chicken? Yes You Can! Well readers, if you’re anything like me (and I would hope some of you are,) then you have a great admiration for simple hearty cooking. The reason I admire this culinary style is because it works with ingredients that fill you up with a kind of warmth that seems to last hours. If you’re like, then you’ve asked yourself at one moment or another “Hey, why have I never made a whole chicken before?” And this is why I’m going to give you one of the simplest recipes I’ve ever seen for making a whole chicken in the over with no more than six ingredients. That’s right, six. Start off by rinsing and chopping up the celery, carrots and onion. Think large course chopping, not dainty. The point of this is to have a hearty portion of vegetables to go with your chicken. Once all your vegetables have been chopped, place them in a large bowl. Take a large roasting pan (or if you don’t have one, do what I did and use the pan you’d normally reserve for making brownies.) Take ¾ of your vegetables and spread them on the bottom of the pan. Pour ¾ of a cup of chicken stock in the bottom of your pan so that it coats you veggies evenly. Sprinkle with some salt and pepper. Set aside. 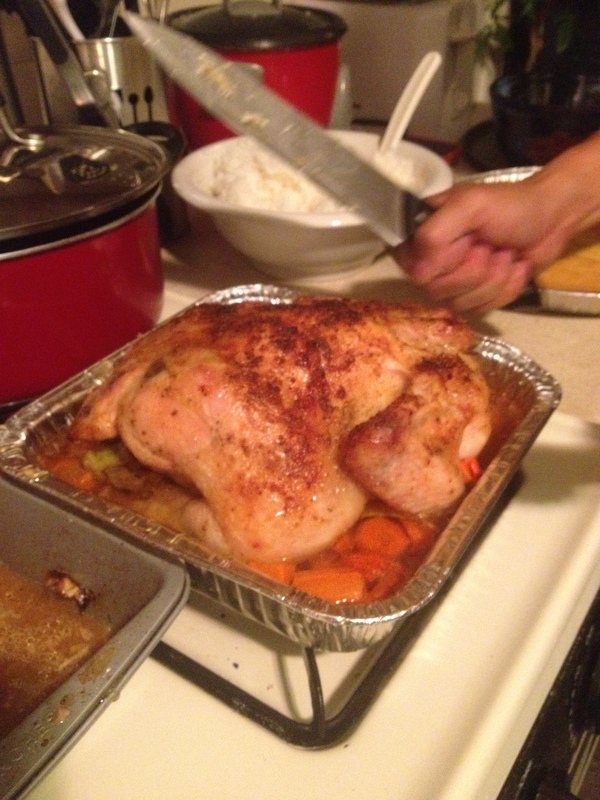 Preheat your over at 380 F.
Take your chicken out of its plastic wrapping and place it on a large stable surface, like a plate or a plastic cutting board. DO NOT USE WOODEN CUTTING BOARDS! Wooden boards have small pores and cavities where bacteria from a raw chicken can hide and you’d risk poisoning yourself when you use t next. Rather, use a plastic surface because it’s easier to clean with something germ killing like bleach. Look over your chicken and trim any excess parts of the skin that you might not like. Once your chicken is prepped, it’s time to give it a butter massage. You are literally going to take a stick of butter and smother the chicken with it. I buttered the bottom of the chicken first (or what I deemed as the flatter part that would rest in the pan easily.) Take the rest of the butter and coat the top of your bird. Take the bird and place it on top of the veggies in the pan. Using salt and pepper, sprinkle the whole bird so that the spices stick to the butter. Once you’re satisfied with your seasoning, take the remaining vegetables and put them inside the bird’s cavity. Pour the remaining chicken stock inside the bird. Once your oven is done heating, place the chicken inside the over uncovered and cook for 1:15-1:30. Once the chicken is browned (and if you want to be more thorough, if your meat thermometer says the inside has reached 180F) turn off the oven. Using a spoon, collect the drippings inside the pan and drizzle over the chicken. Cover loosely with aluminum foil and let it rest inside the warm over for another half an hour.